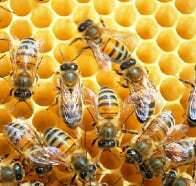 A hive of bees consists of workers, drones and a queen bee. Worker bees are female and they stay in the hive until they reach twenty days old. During this time they produce beeswax, feed young bees and keep the hive clean amongst other duties. As they grow older they travel out into the surrounding area, looking for and collecting nectar and pollen to bring back to the hive. Drones or male bees are so called as they make a low droning noise and stay within the hive, only venturing outside to fly on a very warm day. There is usually only one queen bee in a hive and she's larger than the other bees. She can live for three years or more and is the only one that can lay eggs. Drone bees develop from unfertilised eggs, while worker bees and queen bees develop from fertilised eggs. To produce worker bees the bee larvae are fed royal jelly (another product of the hive), then nectar and pollen. To produce a queen bee the larva is fed purely on royal jelly. While foraging, a colony of worker bees can fly an equivalent distance to that of the moon and back in one day. Each bee may visit up to a hundred flowers in a single trip before returning to the hive, and may make up to two hundred of these trips a day. Communication between worker bees is key in helping each other find sources of nectar, pollen, water etc. This can be in the form of dances such as 'waggle', 'round' or 'tremble' indicating direction and distance to the food. 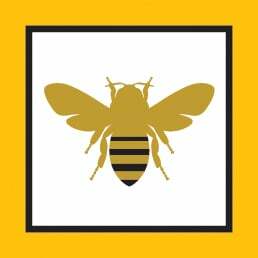 They all have a specific meaning and they vary between different species of bees. Nectar is the sweet liquid which plants produce to attract insects for pollination. Worker bees carry this nectar back to the hive and transfer it to the hive bees to begin the process of producing honey. Pollen is the fine and dusty material that you see on the stamens of flowers which sticks to the body of the bee while it forages then transfers to the next flower it visits. They also collect the pollen in clearly visible 'sacks' on their legs. This cross pollination by bees and other insects is essential for plants to produce fruit and vegetables. In this way the insects play a key roll in providing food for our plates. One of the ways we can improve their lives is to ensure that our natural habitats remain intact wherever possible for diverse foraging.